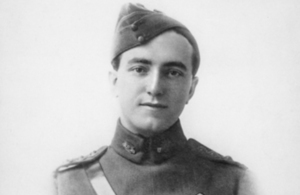 The story of Australian First World War Victoria Cross recipient Francis Hubert McNamara. 66 men from Australia received the Victoria Cross, Britain’s highest award for gallantry, during the First World War. As part of the Centenary Commemorations the people of the United Kingdom marked their gratitude to those courageous men by presenting a bronze memorial plaque to their home country engraved with their names. The plaque is now displayed at the Australian War Memorial. This archive tells their stories. Francis Hubert McNamara (known as Frank) was born on 4 April 1894 in Rushworth, Victoria. He was the first Australian airman to be awarded the Victoria Cross, and the only one in the First World War. Before the war, he was working as a teacher, and joined the militia (now the Australian Army Reserve). In 1915, he was selected for pilot training, and in 1916 he transferred to No 1 Squadron, Australian Flying Corps, which then departed for Egypt. For most conspicuous bravery and devotion to duty during an aerial bomb attack upon a hostile construction train, when one of our pilots was forced to land behind the enemy’s lines Lt. McNamara, observing this pilot’s predicament and the fact that hostile cavalry were approaching, descended to his rescue. He did this under heavy rifle fire and in spite of the fact that he himself had been severely wounded in the thigh. He landed about 200 yards from the damaged machine, the pilot of which climbed onto Lt. McNamara’s machine, and an attempt was made to rise. Owing, however, to his disabled leg, Lt. McNamara was unable to keep his machine straight, and it turned over. The two officers, having extricated themselves, immediately set fire to the machine and made their way across to the damaged machine, which they succeeded in starting. Finally Lt. McNamara, although weak from loss of blood, flew this machine back to the aerodrome, a distance of seventy miles, and thus completed his comrade’s rescue. McNamara’s wound prevented further flying, and he was invalided back to Australia in August 1917 and given a hero’s welcome. In 1921, he transferred to the newly established Royal Australian Air Force, and by 1942, he was an Air Vice Marshall. In July 1946 he became Director of Education at the headquarters of the British Occupation Administration in Germany. He retired to England, and died there in 1961.